A perfect example of when to use the statement. 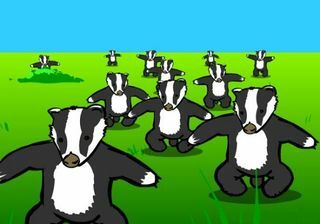 "Badger badgers Badger badgers badger badger Badger badgers" is a grammatically valid sentence in the English language, used as an example of how homonyms and homophones can be used to create annoying viral videos. It has been discussed on the internet since 2003 when the sentence was used by Jonti Picking, a British animator also known as Weebl. It was posted to Weebl's Stuff by Picking himself on February 14, 2003. It was also featured on MTV Europe, for whom Picking produced the cartoon Weebl and Bob. v. the verb "badger" meaning to pester or annoy persistently. Badgera badgersn Badgera badgersn badgerv badgerv Badgera badgersn. [Those] (Badger badgers) [whom] (Badger badgers) badger, badger (Badger badgers). [Those] badgers who are Badgers [that are annoyed by] badgers who are Badgers annoy badgers who are Badgers. Badgers from Wisconsin, who are annoyed by other badgers in their community, also happen to annoy other badgers in their community. THE badgers WHO ARE Badgers AND ARE badgerED BY badgers WHO ARE Badgers, badger (verb) OTHER badgers WHO ARE Badgers. Badger badgers (main clause subject) [which the] Badger badgers (subordinate clause subject) badger (subordinate clause verb) badger (main clause verb) Badger badgers (main clause direct object). A badgered Badger badger off to go badger a Badger badger. Badgera badgersn badgerv Badgera badgersn Badgera badgersn badgerv. Badgera badgersn badgerv Badgera badgersn Badgera badgersn badgerv Mushroomn Mushroomn. That is, "Badger, badger, badger, badger, badger, badger, badger, badger, badger, badger, badger, badger, mushroom, mushroom. Aargh, it's a snake, oh, it's a snake." The phrase is often used in everyday language to describe the vast amounts of badgers and mushroom mushrooms, as well as to warn others that a snake is approaching. The phrase is sometimes used hand in hand with the phrase "Amazing horse," which is a term used to describe any horse that has the ability to turn into a plane, produce lemonade, and take individuals to the universe and all the other places. ↑ Which is what the video precisely does. ↑ Okay, now it just got more confusing. This page was originally sporked from Badgerpedia. Badger badger badger is part of Uncyclopedia's series on Mass Media.